Pups are just the sweetest things, full of unconditional love that would make any heart sing with joy! It is easy to see why pups these days are treated not just like members of the family, but like children for many Moms and Dads! How could you not adore these cute pooches? 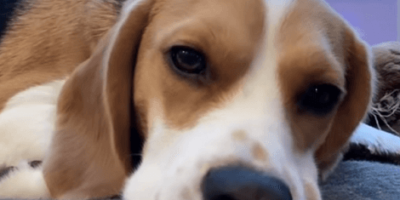 It is no wonder then, that Oliver’s Dad decided to take this vlogging opportunity to talk about Oliver the Beagle pup. Specifically, his teeth! To start off the video, Dad ordered Oliver to be quiet. It is a new command this pup has been working on, so he immediately calmed down as soon as he recognised the word! As Dad points out in the video, Oliver doesn’t show his teeth as a sign of aggression a lot! In fact, Oliver is a pretty gentle pup. To demonstrate just how gentle, Dad puts his hand inside Oliver’s mouth, just to see if he would bite. He doesn’t! When You See What This Pup Does During Back Scratches You’ll Laugh Out Loud!